Eggs are one food that you can never miss on any dining that just in the Japanese diet. The calories in one chicken egg is said to be around 91 calories, which is relatively high. They are a good source of protein and high in fat, but because of the amount of saturated fatty acid contains in eggs eating too much may cause an increase in cholesterol levels. So if you are on a diet or just want to eat right, eating too much eggs is not the way to go. To avoid unnecessary food poisoning it is important to pay attention to the expiration date of chicken eggs. It is not a good idea to eat chicken eggs out of expiration date raw. However, that doesn't mean that you can't eat expired eggs. Cook eggs before eating is the safest way to prevent food poisoning. On method that is use when eggs are close to expiration is beating eggs in a bowl and storing away in for freezing. This may seem like the way to go but unfortunately this won't stop bacteria growth from ruining your eggs. 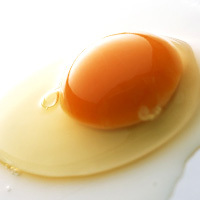 The calories in Egg per 60g(1 large egg) is 91 calories. Egg is calculated to be 151Cal per 100 grams making 80Cal equivalent to 52.98g with 7.74g of mostly protein、6g of fat、0.18g of carbohydrates in 60g while being rich in vitamins and minerals such as Selenium and Biotin.